After several years whereby a number of riders had been suspended after testing positive for performance enhancing drugs, including high profile riders such as Grand Tour contenders David Millar, Tyler Hamilton and Roberto Heras, the cycling world was engulfed in another major doping scandal during the 2006 season. The Operacion Puerto scandal had began innocently enough when vengeful ex-rider Jesus Manzano voiced to the public the doping practices of his Kelme team, of which the Spanish Dr Eufemiano Fuentes was the team doctor. This prompted an investigation into the allegation by the Spanish Guardia Civil, which led to the arrests in early 2006 of several key players in the organised doping ring including Fuentes. Those sent home included Team CSC team leader and 2006 Giro D’Italia winner Ivan Basso, who was later sacked by the team later on in the year. Three time Tour de France podium finisher Joseba Beloki was also sent home after being implicated, although he was soon cleared by Spanish officials in 2006. Team Telekom leader and 1997 Tour de France winner Jan Ullrich was sent home and this investigation effectively ended his illustrious career. Other top line riders implicated included the already suspended Tyler Hamilton, Jorg Jaksche and Alejandro Valverde. From here the UCI and organisers of the Tour de France were hoping for a scandal free Tour de France as Operacion Puerto dominated the headlines in the build up and first few days of the 2006 Tour. Of the contenders left American Floyd Landis shocked everyone with a phenominal Stage 17 effort to recover almost all of eight minutes he had lost the previous day to Oscar Pereiro. It was therefore no surprise that in the initial testing after that stage Landis tested positive for abnormally high levels of testosterone, eventually leading to him being fired by his Phonak team and being stripped of his Tour de France victory a year later. Oscar Pereiro inherited the victory as cycling licked it’s wounds after a disastrous 2006 season. Landis celebrating his 2006 Tour de France triumph, although a positive drug test would soon be revealed and Landis would be both fired from his Phonak team and stripped of his Tour victory a year later. Photo credit goes to unknown. 2007 was similar to the year before with several doping cases in the build up to the 2007 Tour de France. The 2007 Giro D’Italia winner Danilo Di Luca was under investigation for doping and would later join 2006 Giro winner Ivan Basso in being suspended from cycling. From here T-Mobile rider Patrik Sinkewitz was found to have tested positive for EPO in the build up to the Tour and was soon fired by the T-Mobile team before admitting to using EPO and blood transfusions in the past. From here the next scandal broke when pre-race favourite Alexandre Vinokourov and his Astana team were forced to withdraw from the Tour after it was revealed Vinokourov had tested positive for receiving a blood transfusion before stage 13 individual time trial, a stage he won. Team mate and top 10 contender Andrey Kashechkin later also tested positive for the same offence, leading some to speculate a mix up amongst the team led to each rider being transfused with each other’s blood. The final and most dramatic scandal of the Tour occurred late on race leader Michael Rasmussen was withdrawn by his Rabobank team after it was revealed the Dane had lied to the team and doping officials by claiming he was in Mexico in June when he was spotted by an Italian cycling journalist training in Italy. This was to avoid being tested before the Tour and therefore led to his dismissal from the race and the team.This left Alberto Contador to claim victory in a hugely tumultous 2007 Tour de France, whereby several high profile doping cases once again battered the credibility of cycling’s greatest race. Dane Michael Rasmussen celebrates after claiming a stage victory in the 2007 Tour de France, although he would later be removed from the race by his Rabobank team after lying to avoid doping tests before the Tour when only days away from winning the race. Photo credit goes to Peter Dejong and AP. Thankfully for the UCI and cycling fans 2008 was a quiet year for doping within the pro peloton, although there was still a motley crew who were found to have tested positive during the year. The majority were found to have tested positive during the Tour de France, with many testing positive for MIRCERA, a third generation form of EPO. Of those to have tested the most high profile was stage 10 winner Leonardo Piepoli, although the Liquigas team were also forced to leave the race after one of their riders tested positive for EPO. It appears that the new anti-doping regulations implement by the UCI have began to make a difference within the peloton, as the new, far more invasive measures leave riders little room to use performance enhancing drugs. Riders now have to give base values for things such as their hematocrit and blood levels, therefore it’s now a lot easier to detect when a rider has enhanced these levels unnaturally through performance enhancing drugs. Alongside this riders now have to provide quarterly information to the UCI detailing their whereabouts every day and inform the UCI if there whereabouts changes during this period. It has become impossible for riders to successfully dope for a long period of time without being caught, and the public are now finally renewing their faith in cycling. The last two years of the decade passed relatively free from scandal, although some riders were falling foul of the biological passport initive, leading to mandatory two year suspensions from the sport. Whilst the highly controversial Lance Armstrong returned to cycling in 2009, even his presence wasn’t enough to start a doping scandal, although a later USADA (United States Anti-Doping Association) report made it clear based on their evidence that Armstrong had completed a blood transfusion during the 2009 Tour de France. From here the only major scandal to hit pro cycling during this period concerned the 2010 Tour de France winner Alberto Contador. It later became known after the Tour that Contador had tested positive for a small amount of Clenbuterol, which provides breathing assistance, with Contador claiming to have ingested the drug through contaminated meat he ate during the Tour. Whilst he protested his innocence and raced on whilst a verdict on whether to suspend him was made, Contador was eventually suspended in 2012 and his results between 2010 and 2012 would be annulled, which meant he would be stripped of his 2010 Tour de France and 2011 Giro D’Italia victories. Alberto Contador celebrates his victory on the 2010 Tour de France podium, although he would later be stripped of this victory. Photo credit goes to Graham Watson and GrahamWatson.com. In this later period of the first decade of the new millenium, it appears cycling has finally turned a corner with riders no longer being found to have tested positive en masse. Whilst the opening year of this period began with the Operacion Puerto investigation, by 2010 it appeared the cycling community can finally hoist the winners of it’s great races as true winners, instead of seeing them through the eyes of suspicion as to how they won. Despite Contador being found to have tested positive for Clenbuterol in 2010 it appears this was an honest mistake. From here every Tour de France winner since has been free of doping scandal during their victories, something which is both refreshing and much needed within the cycling community, as it looks to recover from a very dark era for cycling and it’s credibility. Let me start part 2 of this blog entry by setting the scene from the previous few years of cycling. After the nightmare 1998 Tour de France, everyone involved was thrilled to have a relatively controversy free 1999 Tour de France whereby the public were very happy to support cancer survivor and fundraiser Lance Armstrong as he completed a fairy tale comeback to win the Tour. What the public didn’t know however was that Armstrong was using suspicious doctor Dr Michele Ferrari to support him with an organised doping programme, which included Armstrong’s gardener following the Tour throughout the three weeks on his red motorbike, ready to deliver banned performance enhancing substances such as EPO to Lance and several other team mates. Whilst the public saw and the organisers pushed forward the ideal of a new clean, era of professional cycling started by Lance Armstrong, the truth was that cycling was entering it’s worst ever period of doping. The new millennium was the completion of a transition within doping, as gone were the days of the teams running professional doping programmes for their riders, who were forced to sort out their doping themselves now as the teams wanted no part of it after the Festina affair in 1998. 2000 also saw the UCI finally make a step forward to curb the rampant doping, with a new test being developed to detect EPO. The test was initially put in place for the 2000 Olympics in Sydney, although it was then used in the 2000 Tour de France. Armstrong’s doctor Dr Michele Ferrari was always kept up to date with the latest tests being developed to curb doping, therefore with the advent of a new EPO test Lance and his United States Postal Service team shied away from using EPO during the Tour, instead choosing to use a more old fashioned and natural performance enhancer: blood transfusions. Whilst this wasn’t a new technology, taking out a blood bag several weeks before the Tour and then infusing it back in during a crucial part of the Tour would provide a natural boost in red blood cells which was also very hard to detect. With this innovation in cycling Armstrong and several team mates followed this process in the weeks leading up to the Tour. Armstrong’s team mate Tyler Hamilton speaks of this in his brilliant book The Secret Race where he states after winning a key warm up race for the Tour the Criterium Dauphine Libere only days before doing the transfusion, and struggling to ride up a small hill in the aftermath of taking out a blood bag. The 2000 Tour de France was once again free of major doping scandal as Lance Armstrong successfully defended his 1999 Tour de France triumph over Jan Ullrich and Joseba Beloki. The sport appeared to be cleaning itself up after two relatively quiet years in terms of riders being busted for doping, although this would all change with the advent of the new EPO test. Armstrong in action during the 2000 Tour de France. 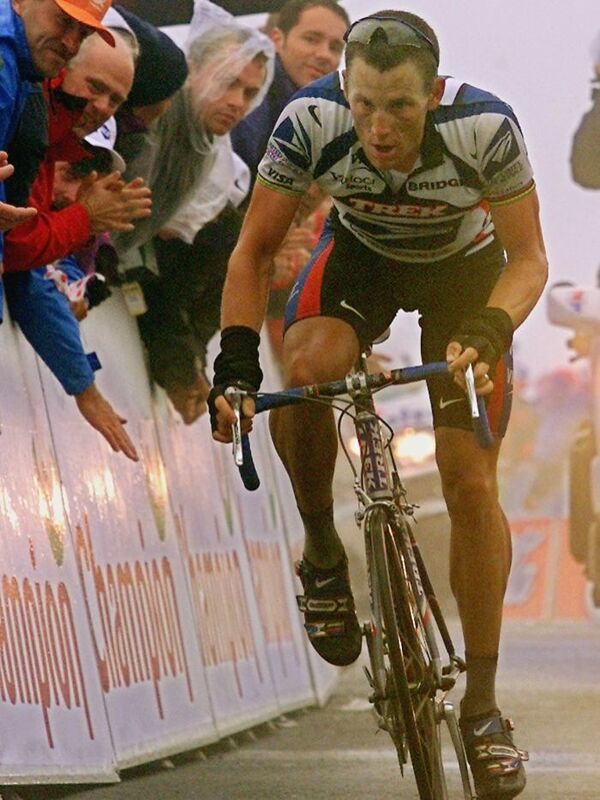 Thanks to http://www.abc.net.au/news/2012-08-24/lance-armstrong-rides-in-the-2000-tour-de-france/4221010 for the image. 2001 saw several riders test positive for EPO, with the first ever being prominent Danish rider Bo Hamburger, although he would later be acquitted after irregularities with his B sample. The 2001 Giro D’Italia would also be marred with doping scandals. Leading contender Dario Frigo would be expelled from the race after police found banned substances when searching several teams hotels. Police uncovered a significant amount of doping products as they searched riders from all 20 teams, leading to several riders being thrown out of the race. This would prove to be the only major doping incidents during the 2001 season, as Armstrong raced to a third successive Tour de France title. 2002 would be more of the same as both previous winners of the Giro D’Italia Stefano Garzelli and Gilberto Simoni would test positive for drugs and face suspensions. 2002 also provided a perfect snapshot of the lack of concern around rampant doping in cycling as the UCI failed to strip 3rd place rider Raimondas Rumsas of his podium position in the Tour de France despite his wife being found with vast quantities of performance enhancing drugs including EPO and growth hormone. His wife explained the drugs were for her mother in law. Rumsas would later be banned for one year in 2003 after testing positive for EPO during that years Giro D’Italia. Raimondas Rumsas on the podium at the end of the 2002 Tour de France on the far right in 3rd place overall. 2003 would look from the outside like any other year with a number of riders being banned for doping, although it would have much wider implications as Jesus Manzano retired from cycling and turned whistle blower with the Spanish Guardia Civil, who’s investigation became known as Operacion Puerto. After becoming disillusioned with cycling he was fired by his Kelme team, Manzano turned whistle blower to the doping practices of the team, which included blood transfusions and various injections of performance enhancing drugs, in co-operation with Spanish doctor Dr Eufemiano Fuentes. The team doctor for the Kelme team would later become synonymous with doping, much like fellow former cycling team doctor Dr Michele Ferrari. For now all the allegations were strenously denied, although these allegations refused to go away. 2004 was another bad year for doping with two well known riders being suspended. Firstly the Brit and former yellow jersey holder in previous Tour de France races David Millar was suspended for two years after police searched his house and found doping products. Millar admitted to using EPO three times in previous years and was banned until 2006. American and former Tour de France contender Tyler Hamilton was also suspended for two years after testing positive for a blood transfusion both after winning the gold medal in the 2004 Olympics men’s individual time trial and during the 2004 Vuelta a Espana. After initially denying his positive tests, once his front line career was over once he returned to cycling he admitted to using performance enhancing drugs in his brilliantly honest book The Secret Race. 2005 was another run of the mill year with several riders being eliminated from the Tour de France for doping, whilst Vuelta a Espana specialist Roberto Heras was stripped of his win in the 2005 Vuelta after testing positive for EPO that year on stage 20. He was stripped of his record breaking fourth win in the Vuelta a Espana, before being reinstated in 2012 after procedural errors with the testing. As the Lance Armstrong era came to a close in 2005, the world of cycling was still being barraged with doping scandals which seriously undermined the heroics presented to the fans and TV audiences by the riders. Whilst the UCI hoped to ride out the storm, little did anyone know the fuse on another major doping scandal was about to blow up in their faces. Please stay tuned for part 3 coming up soon. Professional cycling and performance enhancing drugs. For almost two decades these went hand in hand as the sport was ravaged by a wild west era of professional doping programmes, in which the sport lost almost all it’s credibility and those who cheated prospered whilst those who chose to remain clean rotted on the outer reaches of success in the sport they loved. Doping has always been a problem in professional cycling, as athletes faced with three weeks of immense physical pain have always looked for ways to numb or dull the pain. In the early days cyclists would use alcohol to numb the pain, however from the 1950’s onwards recreational drugs such as amphetamines become the latest technology in doping. 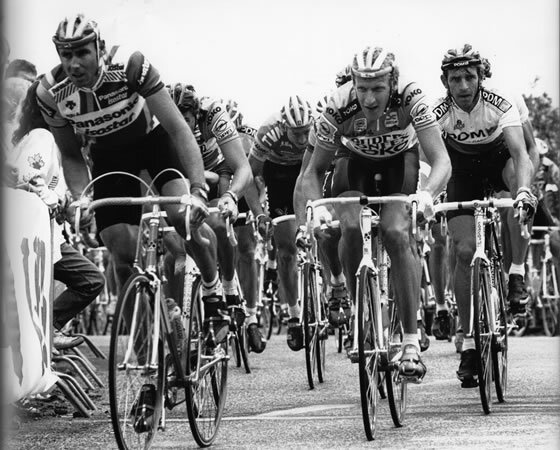 Amphetamines were common place during the peloton for the next 30 years, although whilst they would give riders extra energy they would also alter their thinking and often led to ridiculous breaks which were never successful. De Rooij in action during his pro career in the 1980’s. The game changer in performance enhancing drugs was the development and abuse of EPO. This drug which boosted red blood cells in blood and designed for people with anaemia (low blood count), it was tailor made for endurance athletes such as professional cyclists. Pioneered by Italian riders during the early 1990’s it’s use quickly became widespread, with a sworn secrecy over it’s use leading to increasing doses as riders became paranoid of other riders using more doping products to enhance their performance and gain an advantage on the peloton. During the 1990’s it truly was the wild west in terms of doping as huge quantities of EPO were used and abused to enhance performance. EPO was a game changer not only because of it’s ability to greatly enhance your own performance, but because it was impossible to be caught using it as throughout the 1990’s there was no test available to detect EPO. EPO quickly became the holy grail of doping as a large majority of professional team set up an organised doping programme using highly sophisticated and knowledgable doctors, alongisde high tech equipment to give them an edge over the rest. At the time the UCI, cycling’s governing body, both seemed to have little resources and interest in properly investigating systematic doping in cycling. By the mid-1990’s the first obvious signs of doping distorting race results became clear, with examples being the “miracle” three man break from the Italian Gewiss-Ballan team, that simply powered away from everyone else on the final portion of the race to claim a 1-2-3 at Fleche Wallone in 1994. After the race team doctor Dr Michele Ferrari made his infamous quote about EPO “EPO is not dangerous, it’s the abuse that is. It’s also dangerous to drink 10 liters of orange juice.” It’s probably no coincidence that Dr Michele Ferrari later became synonymous with EPO and doping, as he was a major factor behind the dominance of Lance Armstrong and the United States Postal Service team as they won 7 straight Tour de France title between 1999 and 2005. Youtube Footage of the infamous Stage 16 Hautacam climb made famous by Bjarne Riis in 1996. Another example is the apparent ease with which Danish rider Bjarne Riis was able to tackle the infamous Hautacam climb in 1996. During the later stages of the 1996 Tour de France the riders approached the notoriously tricky Hautacam, known as one of the most challenging climbs in world cycling, yet TV footage showed Bjarne Riis riding it like a Sunday afternoon relaxing training ride. He repeatedly launched himself from the peloton before slowing and allowing the group to catch him again before repeating the process several times. Eventually Riis broke away for good and claimed the stage win comfortably, although his actions were peculiar to many cycling experts as his process of riding hautacam defied convention. 11 years later the public discovered his secret to victory that day as Riis announced he had used performance enhancing drugs including EPO during his career. 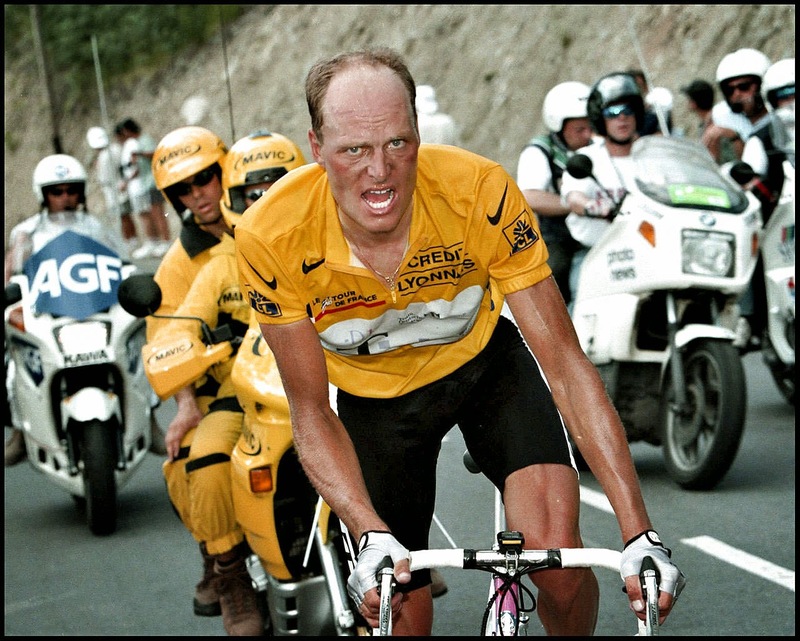 Bjarne Riis shows the pain of his 1996 Tour de France victory. By 1997 the UCI finally took action against rampant doping in cycling, by implementing a 50% limit for riders hematocrit, a.k.a the amount of red blood cells they have in their blood. Some counter however that infact the teams themselves came to the UCI pleading them to implement some measure as they deemed the riders doping to be getting out of control. Whoever implemented the measure it did have an affect in curbing doping slightly, as gone were the days of Bjarne Riis winning the Tour de France with a hematocrit of 60% and over. Hematocrit is vital to cyclists and endurance athletes as the more red blood cells you have, the more oxygen you have being carried to the muscles. This means your less likely to fatigue or get lactic acid build up in your muscles. Therefore, if you can perform at your peak for longer than your rival it’s likely you’ll be able to beat them. For cyclists this became the holy grail in the 1990’s, with a normal persons hematocrit likely to be between 40-45%, however for cyclists before 1997 regular use of EPO and other performance enhancing drugs such as testosterone, Human Growth Hormone and Cortisone would boost their figures to between 55-65%. The UCI implemented the 50% ruling as a “health measure”, therefore when riders were caught with a hematocrit over 50% they were simply suspended for two weeks before being reinstated. From here the status quo remained until July 1998. The Tour de France was eagerly anticipated like any other Tour, however in the days prior to the start in Ireland, a chain of events began which would lead to a complete change in the doping culture of professional cycling. The most successful team in the 1998 Tour de France was the Festina team. Packed with top line riders it was likely one of their riders would win the Tour de France. This would soon change however as team soigneur, effectively a team helper, Willy Voet was stopped by French customs in Belgium as he tried to enter France through a small border crossing by Lille. A routine check of his Festina team car found an insane amount of doping products within, which included 234 capsules of EPO, 82 vials of Human Growth Hormone, 160 capsules of testosterone and various other doping products. After the team at first distanced themselves from Voet, it soon became clear everyone from the team would be questioned once they returned to France. Once it became clear French police had uncovered a systematic doping programme on the Festina team, directeur sportif Bruno Roussel and team doctor Eric Rijckaert were forced to end their denials and admit to a systematic doping programme on the team, which was later discovered to have been funded by the riders. From here all the key players from the Festina team were questioned by police, including star riders Alex Zulle, Richard Virenque and Laurent Dufaux. Virenque clearly bewildered at the 1998 Tour de France. The team would be subsequently thrown out of that year’s Tour de France and all riders apart from Virenque would admit to doping. From here French police searched other teams at the tour and found doping products at almost all the teams. In turn the riders protested about their harsh treatment by police and stage several protests during stages whereby the riders would deliberately ride slowly or even stop for several hours. In the end the incredible victory for the Italian Marco Pantani, who also won the Giro D’Italia that year also, was overshadowed by the ongoing Festina affair. From here things settled down again, with the next major storm surrounding the Italian Marco Pantani. After winning two of cycling’s biggest races in the Giro D’Italia and Tour de France in 1998, Pantani looked for a repeat in 1999 as he dominated the Giro. Only days before the end however, he fell foul of the 50% limit of the UCI and was suspended for two weeks. Although this created many news headlines, the significance in the story was whether he had been set up and did center on doping like the Festina affair had. Pantani being led away by police after his expulsion from the 1999 Giro D’Italia. After the Public Relations disaster that was the 1998 Tour de France over, the UCI and Tour organisers were eager to renew the public’s faith in the race for 1999. They both promised a slower race to show they were curbing doping in cycling. Little did they know however that their biggest problem around doping were just about to begin as Lance Armstrong was coming back to the Tour and was determined to claim victory, whichever way possible. For more on this story please view my second part to this blog entry which will be posted in the next few days. Hope you enjoyed it!